Gallery 2, based in Kilmarnock, Ayrshire offer a comprehensive range of picture supply, maintenance and framing services to suit absolutely every need. From supplying commercial and busines premises, to exclusive prints and original paintings from both local and world-renowned artists we can supply all your needs from our spacious Gallery and workshop near Kilmarnock town centre. 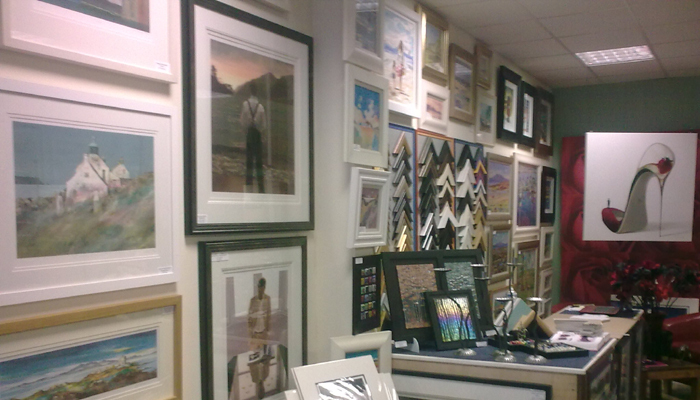 We have parking right outside the shop, so why not park up and take your time browsing our broad selection of artwork. Our friendly staff can advise you on all aspects from choosing a particular frame and glass type to original artwork as an investment as well as for pleasure. If you are looking for a particular print or artist we can help you find it, if we do not have it in stock. We also offer a fantastic selection of quality gifts to suit every occassion from a house warming to a unique piece of hand-crafted jewellery for someone special. .....Or why not just treat yourself! !